2011 was an exciting (and fast) year for NMC! Our company added new team members, launched sites for organizations around the world, strengthened our product offering, and sparked some exciting new partnerships. We're all really proud of the work we did this year for a variety of clients. Below are some highlights from client projects and NMC successes in 2011. ﻿Growing team﻿. We were really excited to add two talented developers to our team, this year! Ashley Bennett joined as a front-end developer right after graduating from UNC's School of Journalism in May. She has been a great addition to our team, designing and coding sites for a variety of clients since she came on board. Tyler Pearson quickly followed, coming on board in September as a designer and developer. Tyler came from West Virginia where he had previously been running his own company, Blue Peak Digital, focused on political campaign websites, making him a great fit to help us serve our political client base in addition to the work he does for our other clients. Finally, at the turn of the new year, Claire Atwell will be joining us as a Project Manager. Claire interned with us while an undergrad at UNC and joined a digital marketing company after graduation until we convinced her to rejoin the NMC family. We couldn't be happier with the quality of people and depth of talent we've added over the past year. Launching more than 50 Fleet Feet Franchise websites. While we are proud of all of the projects we have been a part of in the past year, there's one in particular that stands out to us. Early in the year, we launched a site for Fleet Feet Sports, a national franchise of running gear with more than ninety stores around the country. That process went so well that they enlisted us to setup a standard template that franchises could choose to use. The new template would help unite stores with a common look and brand and also make available many new features powered by our CMS. We were overwhelmed by the response from the franchises and have already launched more than 50 different franchises onto the template. The stores span from California to New York and are all running on a unified template that ensures new features benefit all franchises and that we can continue to improve the template for all franchises into the future. The template lets the stores register people for races, publicize upcoming specials, integrates their social media, provides fitness calculators, and plenty more. It was a real blast to work with so many small business owners around the country and help them launch their new sites. Improving HiFi CMS. While our primary emphasis has been building powerful online campaigns for our clients around the country, we were still able to spend a lot of time improving our product HiFi Content Management System to both benefit our business and the developers around the world using the platform. Improvements have ranged from fine tuning the UI to building out new features. The new features have really rounded out the product into what we think is a premiere platform. NMC occasionally uses different systems like WordPress, Drupal, and ExpressionEngine for certain projects, but each time we complete one of those, we're reminded what a joy it is to have such a powerful and flexible system like HiFi at our disposal. We have heard those same sentiments echoed by other agencies and developers who have fallen in love with HiFi and now use it as their preferred platform. If you haven't tried the system recently, go sign up for a free trial to see the new features and experience the system. Moving to a new office. In November, we were excited to move to our new office, a store front in downtown Carrboro. We're still working on getting the space decorated, but we have already been enjoying the added space and wonderful location. We've enjoyed all of you who have stopped by and encourage others to feel free to poke their heads in. To see the space and read more about why we needed a change, read our blog post about the move. Launching our new site. Early in the Fall, we launched a new site for ourselves. It was a long process as client work always came first, but we are really excited with the final product and how it has been performing. The new site aimed to put our work up front and center and also give clients a better feel for the quality of work we do. We also built in several cool features like our filterable portfolio and our Footprint, which lets you sort through all the content our team is creating. Read what Joel had to say after the launch about the process and some specific features to check out. Going 8-2 in 2011 general elections. We continued our strength in building political campaign websites and online campaigns by going 8-2 in the 2011 general elections. It was an exciting year in politics, and we're proud of all our clients and the work they did. We're looking forward the big election cycle in 2012, and we have already lined up a roster of campaigns that we're really excited to work with and help them win. 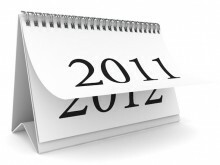 2011 was a great year for our company and that has us incredibly excited for our prospects in 2012. We're excited about projects already in the pipeline and others that we haven't even imagined yet. In 2012, we're hoping to expand our portfolio of mobile projects, as mobile becomes such an important element of any online campaign. We're also excited to take on more custom development projects as our team has technically grown and also been freed up from the initial HiFi sprint. Finally, we want to continue to grow and promote HiFi as the leading hosted Content Management System for developers around the world. All of this of course is in addition to building great sites and online campaigns for our clients and helping them market on the web. It should be an exciting year and we hope to have a chance to continue to collaborate with all of our clients and build on those relationships. None of the items listed above would be possible without the continued support of our clients, friends, and family, and we want to extend a very heartfelt thank you to everyone for helping us continue to grow. We look forward to seeing all of you in 2012 and hope you stop by the new office. Thanks!